Sensible clarification from Checker and Mike on transparency in choice programs. 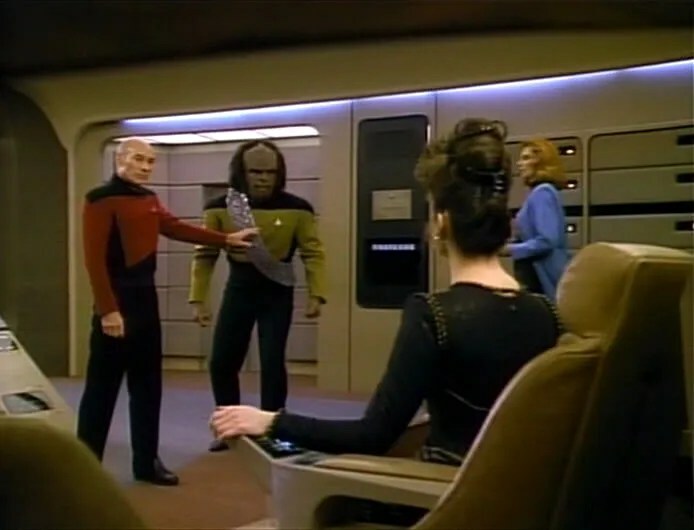 Stand down Mr. Worf, but remain vigilant. This entry was posted on Tuesday, April 1st, 2014 at 7:52 am and is filed under school accountability. You can follow any responses to this entry through the RSS 2.0 feed. You can leave a response, or trackback from your own site. This appears to be just a restatement of their position – we say that we like choice, but when push comes to shove, we demand the right to tell parents who choose schools we think are “bad” that their choices are wrong. Because, of course, the people in charge of the system who decide which schools are “bad” are not only better caretakers of these children than their own parents, they’ll be virtuous and pure and totally not puppets of the unions. Agreed. Nothing has actually changed here. They are still pushing to have all the choice schools under the CCSS regime. Their “concession” is only that they won’t complain too loudly when a state adopts a NNR test instead of CCSS. That’s not really a concession at all. The pioneers of school choice, who privately financed choice programs, could have adopted the same stance that you espouse for STC programs. Fortunately, they were interested in building a case for choice, and a number of the random assignment studies that were crucial to the movement, were cited by the majority in Zelman, etc. resulted from these programs. Contrast that with the tax credit program that passed in our pleasant patch of cactus in 1997. I’m confident that if we had a proper study done, we’d also see positive results. Sadly this has never been possible, creating a blank canvass upon which opponents draw all sorts of fanciful pictures. I fear that this is heading to a bad end. There were three Republicans on the House Ed committee who voted to impose the state test on the ESA program this session. The number in the greater body could easily be greater. Throw in the Democrats, and the numbers begin to look grim. I agree that parental choice is a far higher level of accountability than anything you get from testing. At the same time, transparency free programs strike me as unsustainable. Picking a sensible system now is no guarantee of fending off a terrible one later, but it is hard to fight something with what the vast majority of people understand as nothing. I agree that the process of kicking schools out of choice programs is fraught with peril, especially when one considers how unusual “Goldilocks” regulators turn out to be in practice. If however you decide to go down this road, it is in fact no case for state testing. You can have a go at this function with NNR tests. The important point from my perspective is that Fordham is pretending to offer a “compromise” when they have not really changed their position in even the smallest respect. It’s manipulative behavior and, thankfully, it will fail to accomplish its obvious goal – to trick people in what you call the “choice tribe” into endorsing Fordham’s badly inadequate approach.